"The American founding fathers were dedicated to the project of creating a government both functional and incapable of devolving into tyranny. To do this, they intentionally decentralized decision making among the legislative, executive, and judiciary branches. They believed this separation of powers would force compromise and achieve their goal of ""separating to unify."" 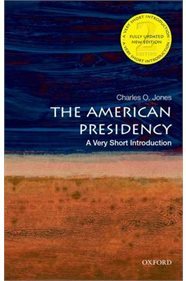 In the second edition of this Very Short Introduction, Charles O. Jones delves into the constitutional roots of the American presidency to show how presidents faced the challenges of governing within a system of separation of powers. This updated edition of The American Presidency reviews crucial themes, including democratization of presidential elections, transitioning into and organizing a presidency, challenges in leading the permanent government, making law and policy, and reforming and changing the institution. It also introduces new case studies from the Obama administration, providing compelling insights into contemporary critical issues such as military power, the role of the First Lady, and the new trends in electoral campaigning-including the stunning advances in mass media and campaign technology. Jones lucidly shows that American presidents are not, and simply cannot be, as powerful as most Americans believe them to be. Accordingly, he stresses the necessity to acknowledge the president's political status and style within the constitutional structure: the president is not the presidency, and the presidency is not the government."